A-HOTEL.com - Luxury and cheap accommodation in Chidvozero, Russia. Prices and hotel, apartment booking in Chidvozero and surrounding. Located in Arkhangelsk, 18 km from Trud Stadium, Baza otdikha Lukomorie provides accommodation with ski-to-door access. Boasting a 24-hour front desk, this property also provides guests with a children's playground. 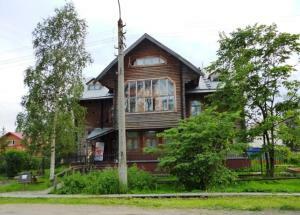 Situated 9 km from Trud Stadium in Arkhangelsk, ул.Кировская, д.
Yanemez Stay offers accommodation in Arkhangelsk. The room is equipped with a TV with cable channels.